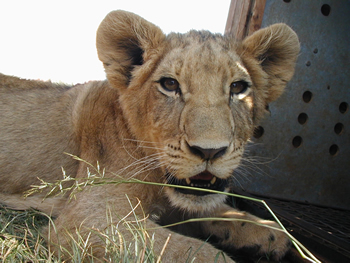 On January 1, 2004, I returned to Africa for the first time in more than 10 years. I was thrilled to feel the pulse of Mother Africa again. But the most exciting part was bringing my 3-year-old boy and my 6-year-old daughter along. Laura, my wife, had been to South Africa previously. This trip was a business trip for her, but the children and I were on holiday! The kids turned out to be real little adventurers. 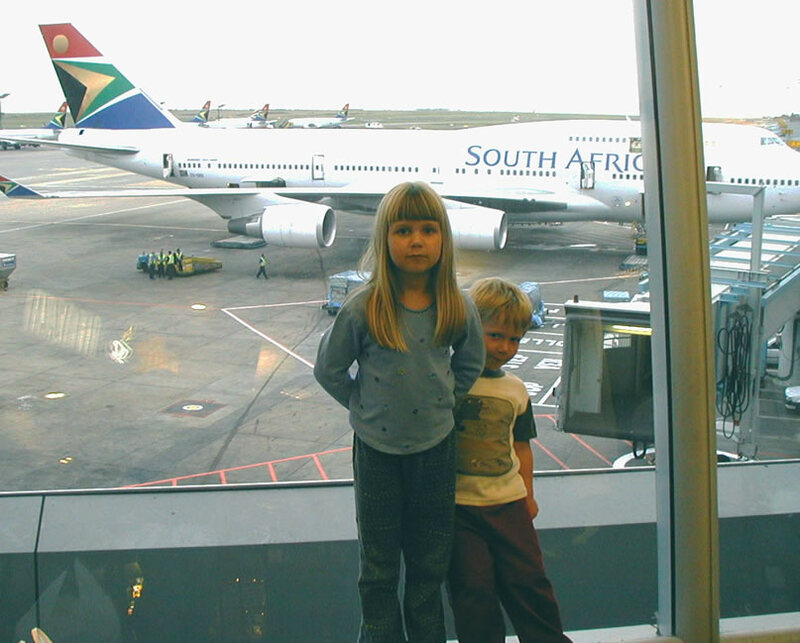 We stayed in Pretoria for a few days, which was fun and interesting, but the real adventure was our trip to northern KwaZulu Natal. Spotting Zebras and Rhinos and Buffalo, and going on trips to discover remote, unspoiled beaches turned out to be some of the kids' favorite adventure fun. And of course splashing in the pool and chasing weird beetles around the lodge was a big hit. I was very impressed by the natural beauty of KwaZulu Natal and by the relaxed, friendly people there. In Pretoria we were careful and mostly stayed in the hotel after dark. The outrageous crime-rate is ever-present in the city, with "carjacking hot-spot" warning signs and the ubiquitous razor-wire. Out in KwaZulu Natal, I felt much more at ease, although crime and political violence are a problem there, too. KwaZulu Natal is chock-full of wild life. It is home to several spectacular game reserves: Huhluwe-Umfolozi, St. Lucia Wetland Reserve, Tembe Elephant Park, Pongola and many more. But not just the Big Five can be found there (Elephant, Cape Buffalo, Rhino, Lion, Leopard). The Indian Ocean is also teeming with hundreds of species of colorful, tropical fish, giant turtles, 14 species of sharks and several whale species. The reefs off Sodwana reportedly are home to 1,600 fish species. St Lucia is also famous for a huge, diverse bird population. Even outside the reserves you can run across crocs and hippos. But even at our lodge, I found huge bugs, a cute chameleon and a tortoise. And every evening we sat on the deck sipping beers or Mampoer, watching the bats hunt bugs and occasionally swooping down and skimming the surface of the swimming pool for a drink "on the fly." Pretoria was a very different experience. 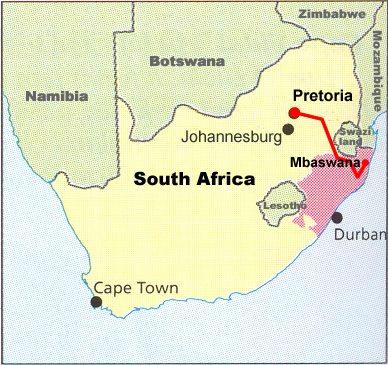 We spent the first five days in the capital of South Africa, and learned a bit about the history of that country. We visited the Voortrekker Monument, a huge, pompous and defensive memorial to Afrikaner heritage. And we saw Union Building, the first South African parliament, and the excellent Pretoria Zoo. But Pretoria is definitely the "whitest" African city I ever saw. South Africa is a gorgeous country full of wonderful people. But this country is struggling under the burden on a bloody history, with the imprint of apartheid and racism still painfully obvious. But the bloody history of this part of Africa goes back to Shaka Zulu's violent exploits, the cruel wars of the Voortrekker and British colonialists, and the nasty Boer War between the Brits and the Afrikaners. Yet there is also a very positive message coming from South Africa. That message speaks of reconciliation and change. And Nelson Mandela is one of the few world statesmen universally recognized for integrity and intelligence.